This photograph was taken on Main Street in front of the J. Howard Williams Company. At first glance, it appears to be a parade float but as you can see the trailer is obviously stationary. Its wheels are chocked and it’s also equipped with electric flood lamps and a microphone. The wire cage on the right suggests a contest – a store promotion of some type. …maybe one (or more) of our class historians has a better memory of that block? Obviously, I haven't been back to Monroe in a long time, but as I recall, the Smart Shop was on the corner, Anne's Dress Shop, Roger's Barbershop and then J. Howard Williams. (The barber shop may have been tucked between Anne's and the Smart Shop--just can't recall.) Beyond that, I don't recall what else, if anything was on that block. How/why was the block destroyed? Back when the picture was taken, based upon who is on the float (Sista Williams and Dot Duncan graduated in 1952), the block would have started with Sells Wholesale, then Anne's, then Rogers' Barber Shop (owned by the fathers of Sue Rogers and David "Bull" Rogers, both class of 1957), then J. Howard Williams (Craven Williams'('58) father), then Farmers Hardware, then Stellens clothing store. The Smart Shop moved to the Sells Wholesale store location at a later date. The block was destroyed by an explosion, which occurred in a store that was in the space to the right of J. Howard Williams (which had become a gift shop owned by Bette Sue Davis ('55) and her husband). Margaret, Your memory is incredible! I remember all those you mentioned. We thought all the "older" kids were so with it and really looked up to them. The first year I taught school at Forest Hills in Marshville, Sue Rogers Goodwin was teaching English. We spent many an hour together with Craven Williams' mom, who taught social studies. Both were exceptional teachers. I was young and dumb and overwhelmed (Who wouldn't have been with 6 classes, 150 students, and no planning period? )and those two were real mentors to me. I'm glad you set me straight about the location of Sells Wholesale. I had it incorrectly placed on the Center Theater block. Oops! Pardon the "Sue." I know better - you have always been called Susan. Excuse me! Maybe it’s just me but I remember all those stores along that block. I remember Mr Rogers, the haircuts, and the good-smelly hair tonic. I remember his “on-the-house” haircut for our graduation and I remember Marine Corps barbers teaching me to recognize and appreciate Mr Rogers’ talents. I remember J. Howard Williams Company and the prizes don’t surprise me. That business always contributed back to that town. No one had a charge card in those days but every one had a charge account at J. Howard Williams Company (without the exorbitant interest rates!). I remember the dress shop too even though I don’t remember ever going in there. 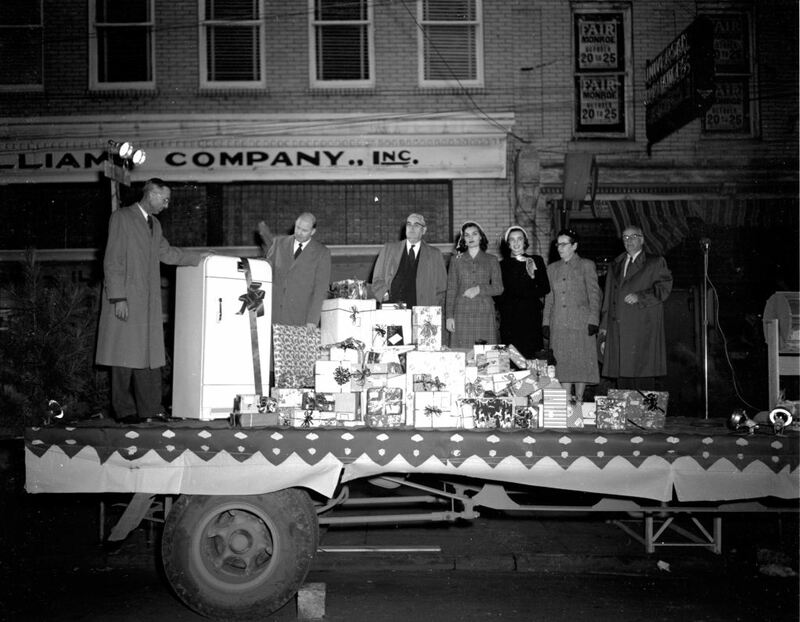 I remember Danny Rogers was in our class of 1963 but, for the life of me, I don’t have a clue who won that refrigerator. Jim, I think every store in town gave folks credit before the days of plastic. We charged our groceries at Secrest Grocery (Isabelle's dad) and Five Points. You could call in your order to Five Points and they'd deliver. It's interesting that Lowe's Foods here at the beach now will take your order over the phone and have it bagged and ready for you when you arrive to pick it up. I don't know if Lowe's does this statewide or only in locations teeming with tourists, but since most of them go brain dead after they cross the ICU onto the island, I guess it's a good thing. Margaret, no apologies necessary. I was always Sue in Monroe, although I hated it. I changed it to Susan when I went off to the University of South Carolina, probably an attempt at sophistication. Today, I answer to almost anything. What's in a name? What fun sharing all these old memories.....and trying to hard to remember some of this! I do remember the Smart Shop, from both of its locations. My Step-Grandmother ("Miss Pearl" Armfield McCollum) worked there for years, moving along with the store when Dr Paul Helms moved it to the Main St corner. Another store....Margaret, you mentioned "Stellens". Wow, not sure I'd ever have been able to pull that up, but once you menioned it, I do sort of remember the name. Wasn't that the same corner shop where The Glamor Shop existed later on? (Across the little side street from Belk's). I just remembered a funny story connected to that. Our Jr year (class of '63) the theme of JR-SR was "Mardi Gras", and someone made a contact with Glamor Shop for some much-needed mannekins, to dress in mask & costume. Well, maybe just because our family had a big old Plymouth stationwagon, somehow I drew the assignment to go pick them up. And, Jim.....I remember that "good-smelly hair tonic" at Charlie's barbershop, too. With two younger brothers, and limited transportation, I would always wind up sitting in there waiting on them. (Actually, I was rather taken with Charlie's production of the Buzz haircuts they always got!). Didn't know about the free graduation haircuts........how nice. Sometimes I'd go next door and just linger outside the windows at J Howard Williams, looking at the display of china patterns picked by current brides. Sad to realize a whole block like that is gone now.........but it seems to be living in our memories quite well. Stellen's and The Glamour Shop were very much alike. And I thin you are right; The Glamour Shop did move into Stellen's spot. Your comment about "living in our memories" applies so well, not only to the downtown of Monroe, but to lost friends, as well. At our reunion ('56-'59) last spring, in my comments I said something about those who could not be with us but who would always be a part of those memories. Our class and those ahead of us are losing members steadily now, and it's very sad. But they will always be with us, just as the town we grew up in. Weren't we the lucky ones?